A classic Sniffy painting from Joe Hargan. Sniffy is pictured as a commentator figure and as a work of art himself. 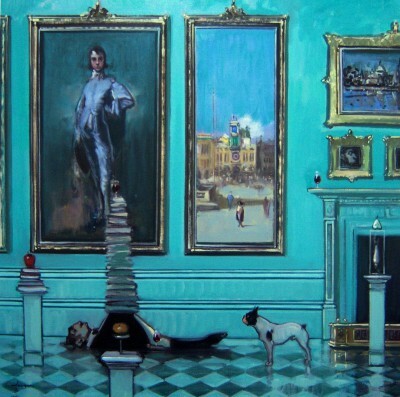 The ‘Exhibitionist’ background art works from left to right are: ‘The Blue Boy’ by Thomas Gainsborough; a section of a Canaletto of the ‘Clock tower’ and the two other works are a version of Venice with the small portrait of Sniffy above the mantlepiece are by Joe Hargan. As with other art works in the Sniffy series there is a tongue and cheek play comparing the traditional works on the wall with the modern constructions on the plinths. From left to right the first plinth has a pile of books representing learning and an apple as a metaphor for fruitfulness. Sniffy with a pile of books on his tummy - learning topped with a wine glass fruits of his labours. The little French bulldog looks on with puzzlement. The plinth in the foreground has the ubiquitous burger and the last plinth has a fish in a case which is a reference to Damian Hirst whiuch is topped with a pear showing seeds a sexual/fertility symbol. Click here to view more contemporary paintings by Joe HARGAN.